Health Canada has issued a recall on sets on small magnets. This item is affected by the recall and is no longer available for sale in Canada. This item can only be shipped outside of Canada. These parts can be assembled into the pictured icosahedron. 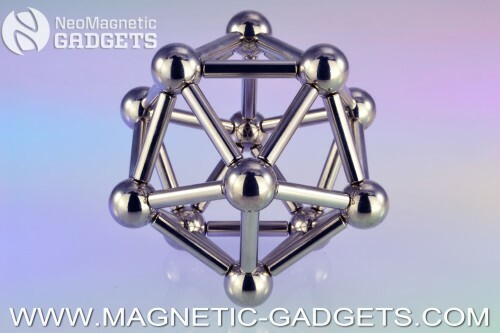 The icosahedron has 12 polyhedron vertices (the steel balls), 30 polyhedron edges (the magnet rods), and 20 equivalent equilateral triangle faces.